This week’s wire forming picture of the week from AWC Industries is the planter basket! 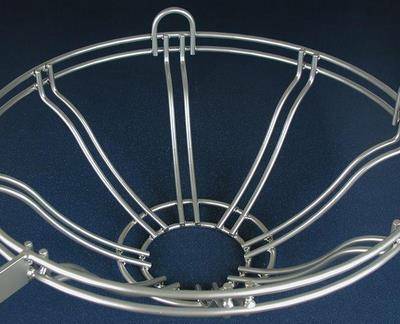 The planter basket is an extremely durable and fascinating wire forming product. This model of wire forming is produced with CNC Custom Wire Forming and can be fabricated up to 1 inch in diameter. At AWC Industries we are Wire Forming experts in the Chicago area as we specialize in high quality CNC wire forming. We provide wire forming of ferrous and non-ferrous materials such as aluminum, copper, steel, brass, and stainless steel. Our wire forming capabilities can handle both high volume production runs and smaller orders. With our wire forming expertise and state of the art equipment, we can assist you on any wire forming projects while providing amazing customer service! Request a Quote with us today for your next wire forming project! Wire Forming: What Materials Can I Use?